Actually, FMCG Mobile-Sales Solution is a eMobile sales management platform: is Web client, in the PC computer through the browser visit, the client to mobile phone content and data management background and maintenance, and by providing comprehensive summary analysis data to provide decision support.tension of business management system from traditional Internet to Mobile Internet. Shown above, this system is made up of one server-end and two clients: "Mobile Adaptive Server + Mobile-Sales Mgmt Platform + Mobile-Sales Client". 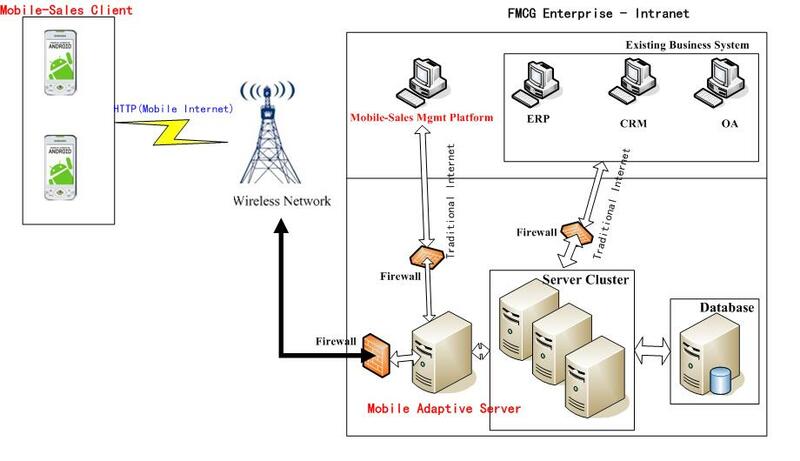 Mobile phone adapter server: it provides service to mobile sales management platform and cell phone client as the application server, and integrate or dock with fast consumption goods manufacturers existing business system through the application integration interface. Mobile sales management platform: it is Web client, can visit through the browser in the PC computer, manage and maintain the content and data of the mobile phone client, and provide decision support by providing comprehensive summary analysis data. Mobile phone client: integrate digital certificate application,access through the Internet, realize sales management, visit management, training support etc. function.